101 more reasons to love fantasy + quick giveaway! 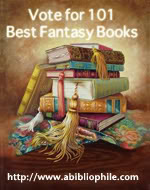 Ryan at Wordsmithonia recently directed me to Bella of A Bibliophile's Bookshelf's project to create a list of the 101 Best Fantasy Books. You have a chance to nominate and vote on the best in fantasy, so if you have an opinion (and I know you do...even if it's just that Twilight - yes, I mentioned it - was addictive, if not good), go and share it, and vote on the very best when that time comes around. Yay! And because book giveaways are fun and happy-making (Uglies trilogy, you've changed my vocabulary! ), and because book-buying supports my favorite authors and creates new fans, I'm giving away one (1) paperback copy of Neil Gaiman's Neverwhere, or Robin McKinley's Sunshine. The winner chooses the spoils. Leave a comment on this post answering the question, "What is your favorite genre?" +1 extra entry if you enter my contest for The Only Alien on the Planet. If you've already entered, you do not need to do so again. Please include your email address. Giveaway is open internationally. Comments will close on August 21 at 11:59pm EST, and I will notify the randomly selected winner via email. Oh, nice giveaway, thanks! My absolute favourite genre is scifi. I love all subgenres of scifi, from books that aren't classified as scifi but have subtle elements to fullblown space operas. I especially love seeing it in teen books (fantasy predominates, but there are some great ones). My favourite genre is fantasy and supernatural. I think that I'd never get bored with it... I could be ninety and still love reading stories of vampires and fairies. +1 extra entry for entering your contest for The Only Alien on the Planet. I have to admit that my favourite genre is women's fiction. Not the fluffy stuff, just the women's fiction that you can lose yourself in when you're having a bad day (or week!). I love fiction in general as well. Please enter me in your contest! I would love to read Gaiman's "Neverwhere"! I've always been drawn to fantasy and mystery. I can't choose one over the other, it would be like picking between your two best friends. I just entered your other contest for The Only Alien. My favorite genre is sci-fi. I like most fiction, but sci-fi is what I always come back to when I just want a fun read. I entered The Only Alien contest. WOw, I just read that comment above - congrats girl! My favorite genre is Fantasy. I just love other worlds, dragons, elves, magic and all the aspects of it. Can I say my favorite genre is YA? Seriously I love most of the books that I read so *shrugs* but if I had to pick then Faeries should be a genre and that's what I choose, anything otherworldly and fantasyish. Bella's project is just so cool! My favourite genre is fantasy. The wonder and excitement that I feel when reading fantasy cannot be recreated with anything else. It really is just magical. I have entered your The Only Alien on the Planet contest. My absolute #1 favorite genre would have to be supernatural/paranormal. I cant get enough of werewolves, vampires, fairies, and witches, they all rock!!! Awesome contest by the way, I have wanted to read Sunshine forever, but the bookstore near my house doesnt carry it!!! I can speak for both of us when I say that our favorite genre is YA fantasy. We're also big fans of supernatural/paranormal. We've entered your other giveaway! I love Teen Fantasy that's my Fav. I love mysteries but I'll read anything. I entered your contest for "The Only Alien on the Planet". Mine is historical fiction, but I really just love a good book and I love being surprised with a great story of any type. Thanks for the giveaway. My favourite genre is Sci-Fi, and my absolute favourite sub-genre in it are the old school pulpy adventure stories, Burroughs and the like. Please count me in. As I already own Neverwhere, I would like Sunshine! My favorite genre is YA fiction. Please include me in your giveaway. I'm really getting into the classics, but I have a soft spot for YA! I love YA fiction although I am sadly no longer a young adult. I also enjoy historical fiction and paranormal/supernatural fiction. I've already entered your The Only Alien on the Planet contest. I just got the Uglies trilogy so I don't have a new vocabulary yet! My favourite genre is scifi tho I'll read all genres and love them. Just beginning to sidestep into paranormal stories. I like history, I like scifi love them all. I love YA especially if it's romantic fantasy. +1 - I entered your contest for The Only Alien on the Planet. Oh definitely fantasy. It gives you so many different worlds to explore. You may be interested to know that the 101 of the Best Fantasy Books project now has it's own fantasy meme. Check it out: Five Fantasy Questions for 101 Fantasy Books Meme.